Michael McKillop used the difficult days as motivation to drive him on to Paralympic glory in Rio earlier. McKillop holds back the tears on the podium. 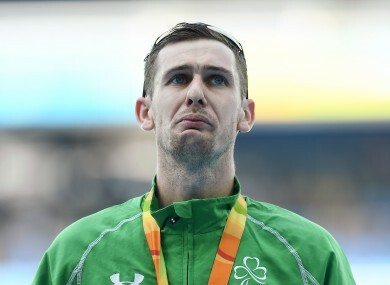 FOR ALL THE memorable days, and this will rank as one of his finest, there have been some dark ones along the way for Michael McKillop so it was no surprise he struggled to keep his emotions in check on the podium. Down in the bowels of Rio’s Olympic Stadium, he was left physically, and mentally, drained after expending every last sinew on the track under the searing heat of the Brazilian sun. Even still, he had mustered the energy to parade in-front of a crowd of 30,000 and take the acclaim of the natives, who, to their credit, gave him an ovation as if he was one of their own. Officials had been trying to hurry him inside to the mixed zone, where the world’s media were waiting. He was going nowhere. This was his moment in the sun, and he was going to savour it. “This one is special because I’ve come through a really tough time,” he said, struggling to hold back the tears. Raw, undiluted emotion. After composing himself, McKillop continued: ”I’m just glad that I was able to go out and win because of the tough times. As recently as five weeks ago, he didn’t consider himself very lucky after slumping to ‘rock bottom.’ After competing at the able-bodied Scottish Championships, he couldn’t get out of bed for days. His body simply wasn’t co-operating. In the four years since London, the 26-year-old has battled with injury and the frustrations spilled into his everyday life. He’s also spoken openly about finding it difficult to live up to people’s expectations. But despite everything — the injuries, the form, the mental demons — he did deliver. He became a four-time Paralympic gold medallist in stunning fashion, obliterating the field after producing a devastating finish. Beijing, London and now Rio. When questions were asked of him by Canadian Liam Stanley, he answered them emphatically, reinforcing his enduring dominance in the T37 1500m discipline and enhancing his stature as one of Ireland’s most decorated athletes. Even when Stanley, a talented footballer who turned his hand to athletics after his country’s team failed to qualify for the 7-a-side tournament, shadowed him, McKillop found another gear. He wasn’t going to be beaten. And that won’t be anytime soon. He underlined his intention to extend his career for another Paralympic cycle and go in search of a fifth gold in Tokyo — and to draw level with his room-mate, and good friend, Jason Smyth. There was a special moment in the mixed zone shortly after McKillop had come off the track when he and Smyth, who was there to lend his support, embraced. Two champions, two friends. Smyth had assisted McKillop’s pre-race preparations, ‘keeping the banter going’ and reminding him that it was his time to shine. He didn’t need a second invitation. Email “From rock bottom to top of the world in five weeks, emotional McKillop seizes his moment ”. Feedback on “From rock bottom to top of the world in five weeks, emotional McKillop seizes his moment ”.